Ding-ding-ding! Relic and Beer’d Collaboration… Round Two! Except it’s not a fight, it’s a love fest. Mark from Relic and Aaren from Beer’d got together again and planned out a second release of their first well-received collaboration. The “round 2” convention works perfectly with this whole concept. The label and name is still perfect – although with Beer’d’s early 2015 expansion and growth, calling them a “nano-brewery” won’t make too much sense if they do a round three. What’s important is that two good guys create beers that we all get to enjoy. As with the first round, the two braintrusts behind the breweries created a recipe and then worked on it separately. So, in essence, we again got two different-yet-very-similar beers. The label was wrong. 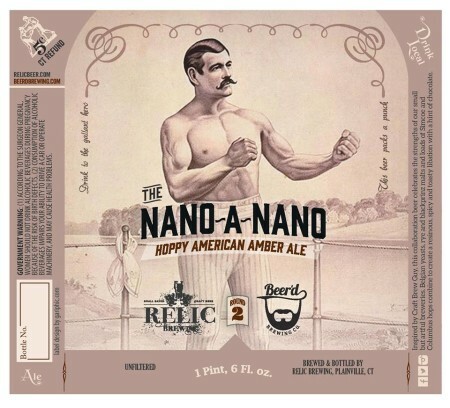 You probably can’t see it, but the description on the right-hand side is that of the first Nano-a-Nano release – the “Belgian Style Black Rye IPA.” No one noticed until the labels were affixed. And with such a limited run of a couple hundred bottles, I guess it wasn’t worth it to re-do them in haste. I disagree, though I’m sure I’m in the scant minority here. I’ve no idea who dropped the ball, but to me, it does reflect poorly on someone. I just don’t really know whom. 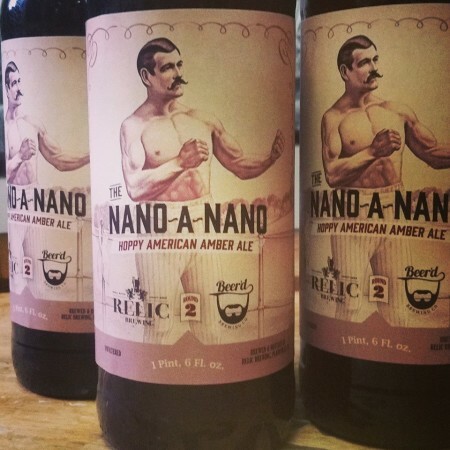 Round 2 of Nano a Nano is a hoppy Amber ale with resinous and citrusy hoppy flavors. Big orange/pine aromas and a balanced malt backbone. Owing to my new resolution to sort of chill out with the bottle chasing and all that stuff (note: y’all can still offer to help me out if you like these reviews), I didn’t go to Stonington on a weeknight for a bottle, nor did I even make it over to Relic in Plainville. Fortunately, my friend Chris did get to Plainville and secured a 32 of each version. Then we met up at a wonderful establishment where we were able to share some beers we’d gotten with each other. As you’ve figured, one was this Relic version of the Nano Round 2. Smell – wow, it’s bright and hoppy and citrusy! Drink – wow, wow, wow! This beer is very, very good. Like, super good. Now, I will freely admit that the style of this beer is one that I happen to love (when done correctly), so like all my reviews – don’t listen to me, listen to your own palate. But yeah, Round 2 was worth the effort to have some. The “malt backbone” was about as present as far as a coloring agent, but I didn’t really get much of it at all in the taste. This was a dark looking amber that tasted like a straight up New Zealand hopped IPA . With these Nanos, everyone likes to play the “which is better” game. Which, although I’ve done it and I’m about to do it again, is just silly. 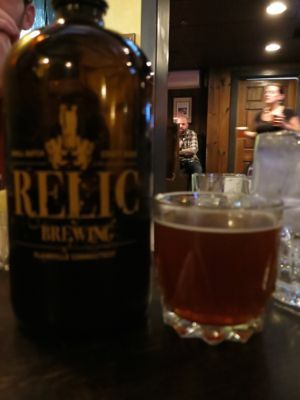 But Relic’s version was a teeny tiny bit better than Beer’d’s, but it was another draw. Nice “fight” guys, may they all be such well-fought draws.